Pigall's, Ohio's only 4 star restaurant will be closing this Saturday, 28 February 2009 after serving seven years of fine French cuisine. I am at a loss of words; I think this NPR feature sums it up well. I want to focus my last supper there, this past Wednesday evening. One day before our reservation, I called to confirm the reservation and the feasibility of serving me a safe, gluten-free meal. They assured me "this is an easy one" and they noted it in the reservation notes. When we checked in with the Maître d', he eloquently said that gluten free is the easiest to accommodate since they never use flour in their sauces; they are reductions. That's the way it should be. One great thing about the menu is that the Executive Chef, Jean Robert de Cavel, prefers to source his ingredients locally, here in Cincinnati. Amuse-bouche: A tart apple, cabbage, mustard, and cider vinegar amuse; and a smooth and creamy salmon with melon on top of Crème fraîche amuse. Yes, it did open my appetite. First Course: Jonah Crabmeat Salad with Apple, Endive & Avocado, Cider Sorbet, Ginger Apple Dressing. Check out that beautiful turquoise salt (from Findlay Market)! Main Course: Skatefish Wing with Light Vinegar Sauce, Creamy Spinach & Celery Root, Horseradish Potatoes, Trumpet Royal Mushrooms. Dessert: I chose the selection of fine artisan cheeses with compotes and plum sauce. I asked it they could substitute the bread for apples or pears. It was served with these beautiful pears. O Thanasis in Athens - My Favorite Restaurant in the World! Yes! Demetrius & I bought our plane tickets for three glorious weeks in Greece coming up in August. I can't wait! We'll spend some time in Limnos, Crete, Lesvos, and of course Athens. 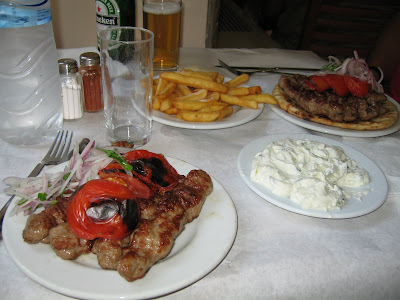 Two days in Athens is enough time to eat at O Thanasis at least twice, like I did my last visit to Athens. I could eat there twice a day. . . . Oh, Thanasis! They hands down have the best souvlaki/kebabs in the world. I know what you're thinking . . . What, gluten-free? Yes, without the pita. It is as simple as that. No worries - endoxi! Thanasis is located in centrally at the corner of Monastiraki Square, where more of the local scene happens (as opposed to the touristy Plaka). It is always busy. Always. Getting a table either inside or outside proves itself to be a team effort. Their menu is very short, consisting of the Greek basics: horiatiki (Greek salad), tzatziki, souvlaki kalamaki (shish kebab) served with pita bread and perfect french fries. Need to be gluten free? No problem, just order the kebabs without pita. Who needs extra bread anyway with these beauties? Just look at this picuture. What make Thanasis so addictive? Maybe the crack they put in the kebabs? LOL. The quality of ingredients combined with the simplicity they cook is key. First off, no filler are in the kebabs - just beef, lamb, pork, nutmeg, cumin and other secret spices. The kebabs and tomatoes are grilled to perfection with some sweet carmelization. Even the red onions are perfectly prepared: shredded transparently thin and soaked in cold water removing the bite and served with chopped parsley. The french fries are another highlight, fried to perfection with the crispy outside and tender inside. The produce is sourced locally and screams flavor. One interesting observation I made on the table was no pepper, instead it is paprika. Very colorful. This place is worth the wait. In the meantime, D&I will try to recreate this gluten free goodness on the grill. Yesterday I had a tasting party amongst my foodie friends that are happy giving their unsolicited critique and turn it into good conversation. This was my first one. The menu consisted of ultimate peanut butter cookies done three ways, salted coconut caramels, molecular gastronomy chocolate mousse done 2 ways, and Indonesian peanut curry chicken. The tasting was a lot of fun with some great insight from my tasters. The worst feedback, as I told them, was "yeah, this is good." That feedback I find unacceptable; that is why I do not allow family to these events. The Indonesian peanut curry is a dish I have been perfecting since last summer for entering a chicken cooking contest. The inspiration came from eating at incredible Indonesian restaurants in Amsterdam. I loved the complexity and richness of the flavors and sauces and I want to recreate them in this dish. The dish still needs some tweaking. 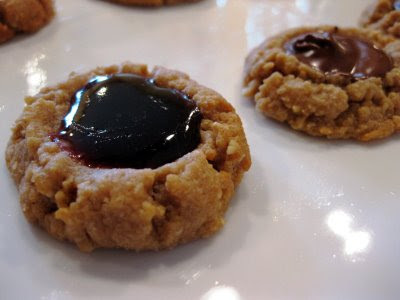 I am never satisfied with good recipes; they have to be mind-blowing and addictive. I never did hear anything from that cooking contest. That signified to me that it does need work. What is important to this recipe is that it does capture the essence of an Indonesian peanut curry? I knew that the base had to be coconut milk and peanut butter. From there, the flavor portfolio had to be balanced and complex considering the herbs and spices in the region of the world. Garlic and ginger are a given, as well as lime juice and brown sugar. For the salty savoriness, fish sauce is critical. Then the heat needs to enter in here via chili sauce, black pepper, and red chilies. What else? At first I was thinking nutmeg, but now after peer feedback maybe some coriander in the curry and cilantro as garnish? And maybe add in more regional veggies for color like carrots and long beans (or green beans here) for distribution of the intensity of the curry? My next iteration my also replace the julienne chicken for broiled/fried tofu for a different complexity in the texture of the dish; this will also accommodate for my vegetarian taster. I am excited to evolve this dish more and hopefully morph it into what my intention is; recipe work is a labor of love and a good network of tasters! I wanted to make a comfort food dish with love for my husband after rough winter travels for work. What better way to show love than with risotto. Risotto comes from the heart, aching for attention to be stirred, giving it much needed drinks of broth from time-to-time, adding the right flavors at the right moment for the best impact. Risotto lends itself to be a technical dish, in that the technique of how you make it can make or break the dish, as I have learned from Marcella Hazan's "The Classic Italian Cook Book." This book along with James Beard American Cookery I will never let out of my control; just as my step-father did. He and I would cook Italian food frequently over the years; I refer to him still to this day as a "born-again Italian". I miss him. I think he would have liked this recipe I came up with, just as my husband did the other night. Heat the chicken broth with the dried porcini mushrooms (can be done in microwave or stovetop). Keep it hot until completely used. Using a 3-4 quart saucepan, warm 2 tbs oil over medium heat and saute the shallots and garlic until aromatic and transparent (about 5 minutes). Add in the rice and stir until this is aromatic, too (about 2-3 minutes). Slowly add in 1/2 cup of broth, and stir a couple of times. Let cook until almost absorbed, and repeat step 4. This will be repeated using only 1/2 cup additions until desired consistency and texture of rice is achieved. This can take 30 minutes total with some stirring. Do the following steps while it is cooking. Add in seasonings about half way & taste at end. Add more as needed. Meanwhile - In a small skillet, warm 2 tbs oil over medium heat and add in the fresh mushrooms and saute occasionally until cooked (about 15 minutes). Added mushrooms into rice when cooked. Add in the peas into the rice. Meanwhile - Using the small skillet, saute the shrimp until just pink. Add into rice very last. That is when you have acheived your desired consistency of the rice (amount of liquid) and the tenderness should be a tender al dente. Today is another cold, snowy day in the 'Nati with a fresh 6" layer of snow and the temperature not breaking out of the teens today. With my Cooking Skills Development Class/Lab canceled, I decided to stick to my roots and cook up a rustic comfort food with not much stuff in the fridge. I knew exactly what I was making - a hardy pasta dish with a sauce that was rich and flavorful on top of my delicious Le Veneziane corn pasta. The sauce consists of tomatoes, hickory smoked bacon, pinto beans, and onions. Simple, rustic, and satisfying. Let us start with the sauce. First, warm a little olive oil in a saute pan with 1 small onion finely sliced with 3 strips of hickory smoked bacon, chopped. Saute over medium heat until the onions become transparent and both the onions and bacon start to caramelize. Grind some black pepper in. Add about 1/2 cup of pinto beans with stirring. At this time, throw some corn pasta to boil. I used Le Veneziane Pipe Rigate. Just look at that beautiful yellow color with a perfect al dente texture. Back to the sauce: add in ~1 cup of tomato pasta sauce (I make from cooking down 1 can tomato sauce + 1 cup drained diced tomatoes + 1 tbs olive oil + garlic + basil + oregano + salt + pepper). Serving suggestion as in picture, but tastes better when it's all mixed together. The pasta catches the beans on the inside with the tomatoes, onions, and hickory smoked bacon on the outside of the pasta. Yum. It did warm me up nicely. I will only endorse a product if I passionately love it. 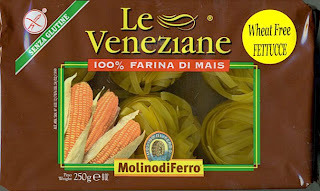 Le Veneziane pasta is one of those products. Since Italian is my focus area of my culinary training, I am very picky about pasta. This corn pasta is exceptional: beautiful yellow color; easy to obtain the al dente texture; not gooey upon cooking; and the flavor is sublime with a delicate corn flavor that compliments whatever flavors are bought in the pasta dish. I just recieved my case of Le Veneziane past today and I'm so excited; I ordered it from Quattrobimbi. My true test to see how good this pasta really is, was to serve it as a second course (traditional pasta course in Italian cooking) with a fresh pesto (without cheese, too) to a very picky friend from Bolgona, Italy. He loved it. He said, "Finally, some food that reminds me of my homeland." Yes! Tinkyada Brown Rice pasta will suffice for me if I'm in a desperate bind and I'm fresh out of my Le Veneziane, but it does not really serve as proper pasta. My husband, who is not gluten intolerant, prefers Le Veneziane to ANY pasta out there. But when it comes to any of the brown rice pastas, he prefers to pass on it. Please try this pasta. It is a saving grace to all of us who are gluten free & wheat free; and the Italians make it unapologetically so.